LeadGenius combines machine learning and human researchers to deliver a powerful B2B Marketing and Sales platform. Yesterday, they announced a $4M debt and equity round which was closed to add multi-channel capabilities to their already successful outbound, account based marketing (ABM) efforts. LeadGenius’ customers include Square, Google, Box, eBay and fast-growth companies like NerdWallet, Weebly and CareerArc. 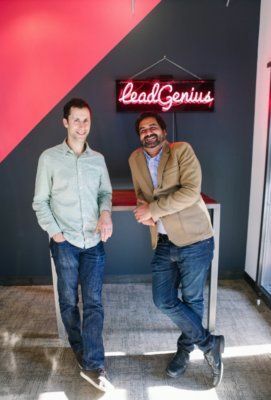 Above: LeadGenius cofounders David Rolnitzky (left), chief product officer, and Prayag Narula, CEO.